So just recently I had some folks here locally talk about how good I am at growing seedlings, how well I do with a little apartment garden, etc. Their thought was that I could write a book to help others be able to do the same. Funny thing is that while a blog came to mind, which is why I originally started this site, I hadn't thought of writing a book. Odd since I've looked so hard for such a book for myself and never found one. Read more about A book?!? I've decided this year I've got to take some time off from growing seedlings. Our apartment has become pretty cramped with my workspace for my job and an extra family member, so there's just really not enough room for them. I'll grow some outside for myself, but no thousand seedlings for sale this year. Hopefully next year we'll be in a house and I can get back to growing. In the meantime, I hope to write up more blogs on how to's, tips, etc. Now that we've had a few warm days in a row, flowers around here are blooming like crazy! This is the shelf I have. It's a Husky 5 shelf heavy duty shelving system. It can hold up to 1,000 lbs per shelf, so it's more than enough for some plants and lights. Once we get the shelves rearranged, there will be about 1.5' between each shelf, which is more than enough. I wish it had one more shelf, as that would be perfect. I haven't been able to find a replacement or add-on shelf anywhere for it. I wish I had seen this one when I bought mine, as I would have liked gotten it instead. It's the same brand and same type of shelf. The only difference is that it is 60" wide instead of 48". That means you can fit 6 trays on each shelf. Ordered several new seeds today, so soon I'll have some new items to add to the inventory. Also ordered two different kinds of strawberry roots, so I'll be able to sell strawberry plants this year as well. One I've grown before and it is VERY prolific - it was still growing strawberries when it snowed here in November. The other grows very large, tasty berries. I'm looking forward to trying that one out. Click read more below to see photos and descriptions of the tomatoes, eggplant, strawberries, greens, and more that we'll be adding to the site. 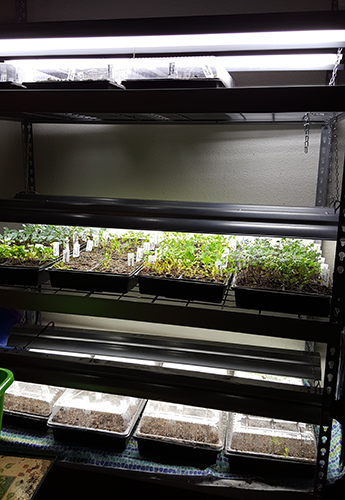 Since it was time for the peas to start popping up, I needed to add lights to the third shelf where those plants are sitting. So on Friday I ran to Home Depot and picked up everything I needed to add two more lights to the shelf. I now have three shelves of plants with 2 lights on each. 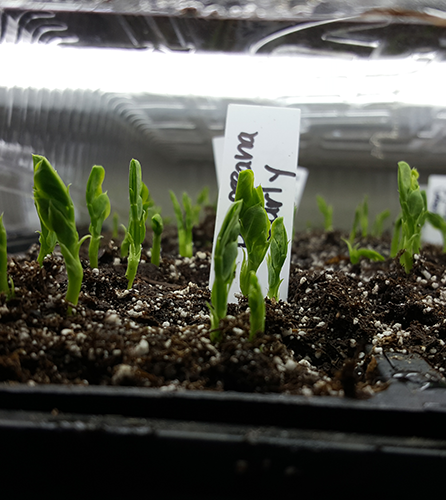 And it was a good thing, too, as by Saturday morning there were a whole bunch of peas that had popped up. Now they'll have the light that they need. So, I started more seeds today. 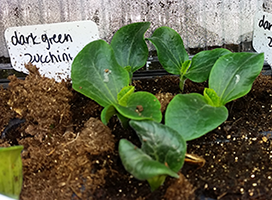 It's an ongoing process to grow seedlings, as some plants need more time, some you grow early in the season, some you start later. As such, I usually have seeds going into dirt from January through April - even later if I do a fall planting. What to do with old soil? A question I see a lot from people who container garden is what to do with the soil from last year that is in their containers. Do they get rid of it? Reuse it? What? It seems like every year once we get close to growing season that this question comes up. There are a lot of options. If you have a compost pile, you can dump all of the old soil that doesn't have plants currently growing in it, bulbs that will come back each year, etc. This gives it a chance to be reinvigorated by the nutrients it picks up from your compost heap. But what if you don't have a compost heap? 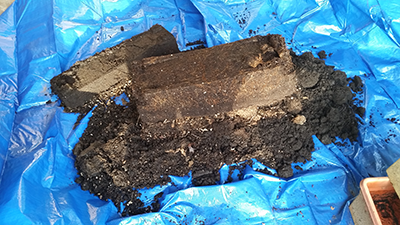 Read more about What to do with old soil? Welcome to my blog on container gardening. I live in an apartment and as such don't have the option to plant anything in the ground. As such, I gave dozens and dozens of containers surrounding my patio filled with herbs, vegetables, fruits, and flowers. I started out with just a few planters of strawberries around my garden. Then I added a few hanging baskets of flowers for our daughter. Each year I've expanded and expanded my garden. I've been buying bigger and bigger containers and adding new plants. I've found some things that have worked well for me - like the Asian finger eggplant that produced probably 100 eggplants - and things that haven't - my rapini never grew and it's just too cold for melons to do well. I hope to share what I've learned thus far, tips, and more through this blog. I also hope to hear from you about what has worked for you. Be sure to check out the photo galleries! Lots of photos there showing what I'm growing, how the plants are doing and more! Get updates regarding seedlings for sale. Jenni has been growing a container garden around her apartment for more than 10 years now. Over the last 6 years or so, she has started gardening heavily, with more than 50 various sized pots and containers around her patio. She lives in the Portland, Oregon metro area (Gresham), which is the 8b plant hardiness zone. Every year she is able to grow a large amount of vegetables for her family and sells seedlings she grows to help cover the cost of growing plants every year. Jenni started this blog to help people find advice and assistance with container gardening, particularly for renters who don't get a lot of control over what they can and can't do with their space. Come pick up some plants! Want to advertise on this site? Contact us.